^ Jenkins, Farish (1974). Primate Locomotion. New York: Academic Press. p. 61. ISBN 0123840503. ^ Törmälä, Timo; Vuorinen, Hannu; Hokkanen, Heikki (1980). “Timing of circadian activity in the flying squirrel in central Finland”. Acta Theriologica 25 (32–42): 461–474. http://acta.zbs.bialowieza.pl/contents/?art=1980-025-32-42-0461 2007年7月11日閲覧。. ^ Friggens, M. (2002). 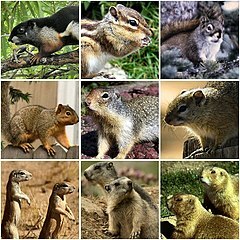 “Carnivory on Desert Cottontails by Texas Antelope Ground Squirrels”. The Southwestern Naturalist 47 (1): 132–133. doi:10.2307/3672818. JSTOR 3672818. ^ Bailey, B. (1923). “Meat-eating propensities of some rodents of Minnesota”. Journal of Mammalogy 4: 129. ^ Wistrand, E.H. (1972). “Predation on a Snake by Spermophilus tridecemlineatus”. American Midland Naturalist 88 (2): 511–512. doi:10.2307/2424389. JSTOR 2424389. ^ Whitaker, J.O. (1972). “Food and external parasites of Spermophilus tridecemlineatus in Vigo County, Indiana”. Journal of Mammalogy 53 (3): 644–648. doi:10.2307/1379067. JSTOR 1379067. ^ Bradley, W. G. (1968). 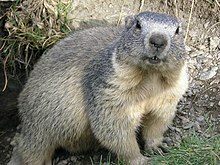 “Food habits of the antelope ground squirrel in southern Nevada”. Journal of Mammalogy 49 (1): 14–21. doi:10.2307/1377723. JSTOR 1377723. ^ Morgart, J. R. (May 1985). 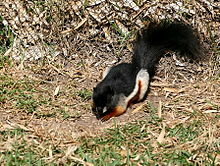 “Carnivorous behavior by a white-tailed antelope ground squirrel Ammospermophilus leucurus”. The Southwestern Naturalist 30 (2): 304–305. doi:10.2307/3670745. JSTOR 3670745. ^ a b c d e f Richard W. Thorington, Jr. (2012). 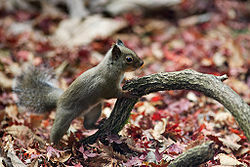 Squirrels of the World. Johns Hopkins University Press. pp. 1-2. ^ Wilson, D.E. ; Reeder, D.M. (2011). “Class Mammalia Linnaeus, 1758. In: Zhang, Z.-Q. (Ed.) Animal biodiversity: An outline of higher-level classification and survey of taxonomic richness”. Zootaxa 3148: 56–60. http://mapress.com/zootaxa/2011/f/zt03148p060.pdf. ^ Emry, R. J.; Korth, W. W. (2007). "A new genus of squirrel (Rodentia, Sciuridae) from the mid-Cenozoic of North America". Journal of Vertebrate Paleontology 27 (3): 693. Steppan, S. J.; Storz, B. L.; Hoffmann, R. S. (2004). 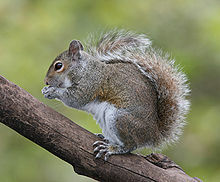 "Nuclear DNA phylogeny of the squirrels (Mammalia: Rodentia) and the evolution of arboreality from c-myc and RAG1". Molecular Phylogenetics and Evolution 30 (3): 703–719.